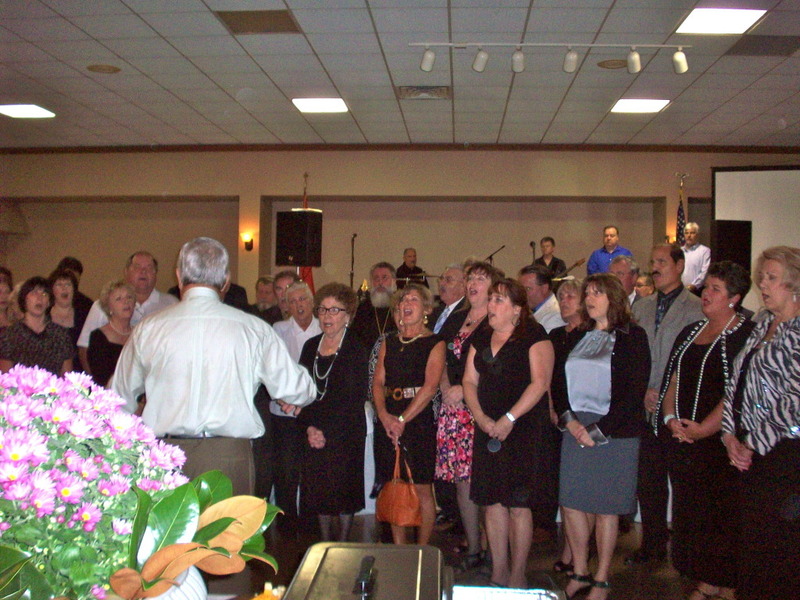 South Bend, IN - The Saints Peter and Paul Church parish in South Bend held their gala 100th Anniversary celebration this past weekend. His Grace Bishop Longin gave blessings for the occasion and presided over the festivities along with several clergy members in attendance: parish priest Rev. Sasha Nedic, Rev. Lazar Kostur, Rev. Marko Matic, Rev. Aleksandar Novakovic, and Rev. Dobrivoje Milunovic. Milan Medich, church president, directed the combined choirs from Sts. Peter & Paul South Bend, St. Elijah Merrillville, and St. Sava Merrillville, who sang opening prayers and gave a fantastic choral performance accompanied by MISMO Tamburitza Orchestra. Bishop Longin addressed the guests and presented Gramatas to Rose Mandich, Bud Medich, and Eve Balaban for many years of hard work and dedication to their church. Rev. Sasha Nedic, Milan Medich, Rev. Kostur, Valerie Phillips, and Rose Mandich all spoke of their experiences of church life through the years. David Medich, event chairman and vice president, also made remarks. A 100 year commemorative video played throughout the evening, made by Robert Medich. After a delicious dinner, SUMADIJA Orchestra played for all the kolo dancers as they danced the night away. Our sincere Congratulations to Sts. Peter & Paul Church on this joyous celebration. Special thanks to Paul and Xenia Jancarich for the photos and contributing story.